I am a child of the 60s, 70s, 80s, and 90s. It sounds like the call sign for junk, pop radio, doesn't it? In truth, I am, as is everyone of my generation, and the generation before us, and that generation before them, a child--a "product"--of the 19th century. We are all Victorians. We are the new Victorians--"the 'other' Victorians"--as Foucault so memorably described himself, us, and you. If you are younger than I am, you, too, perhaps feel unmoored from the 19th century, perhaps do not even know what it is, what that means. I assure you, the only thing that divides me from you is this understanding: We are still living in the 19th century. And we live very much in the 19th century A.D.--"of our Lord," Jesus Christ, though not in any sense he--or even He--would recognize as living during such a time. "We" are "living" it "up"; but we are not living. Friends, we are at the end of days. And it isn't the one indicated to us in Scripture, in the inscription, of The Word--an "in scripture," an inscription, a script, which, as its name clearly indicates, is a writing, a quotation, because all writing is a quotation of something and thus a something subject to misquotation, mistranslation, emendation, animus, amendment, redaction, addition, subtraction. No, in fact, the coming apocalypse arrives, at what may be the actual end of the industrial, 19th century, by way of "Science," which is--the public discourse of which is--only another indispensable invention of the 19th century. We are living at the End of Times, during which the agricultural year of dependable, repeating cycles is overtaken by and dissolved into high-speed and the overproduced, entertainment version of high-speed called instant gratification. As the early, seasonal manifestation we are coming to know so well, perhaps even, perversely, getting used to, illustrates; yes, the awkward disturbance in, and disruption of, the seasons, which used to number four, makes so clear--the times of Autumn and Spring are subsumed by Winter and Summer, which then start turning into each other in alternation. Your latest evidence is the Winter of 2014, with snow and freezing temperatures interspersed with 50 degree days, and a Summer in Ohio, traditionally a time of luxuriant, overwhelming humidity and heat, reduced to a bizarre string of 50 degree days and nights during the high summer of July and August, followed by a September heat wave in New York coinciding, exactly, with snow in the Midwest. Seasonal time is out-of-joint; time is out of joint. And this is just one of the many gifts of the 19th century and its passion for unregulated industry, which has returned to us in the 21st century, a time we live in in name only. The BBC doc, Running Up that Hill, has made me relisten to some Late Bush. As a serious fan of the woman, I must confess, The Red Shoes, Aerial, and Director's Cut did not receive a very fair listen from me when they came out. This was a mistake. This was a mistake that I have rectified over time. Aerial is a stupendous album that I am ashamed to have ever neglected. The Red Shoes has grown on me in ways I never expected. Director's Cut--which one friend dubbed "a crime against music" at the time, based primarily on the new version of "Deeper Understanding" (and, at the time, Reader, I didn't disagree), and which another friend defended powerfully, though he was troubled by 50 Words for Snow in ways I couldn't comprehend--is also a secret gem, especially the extended version. This case in point--Director's Cut is entirely a revisit to earlier material from The Sensual World and The Red Shoes (two albums that dovetail into each other all over the place)--with remasters and re-recordings of songs that were already well-known to me, and I didn't get it; I didn't understand the album. Leaving anything and everything else behind that one might want to say about the disc (or the 3 disc set, which is the definitive option), the remaster of "You're the One" is a staggering piece. With Gary Brooker nailing your mind and heart to the wall with the Hammond organ, in a rather Motown/Atlantic R and B fashion, actually--which in the remaster melts into the Trio Bulgarka, in this really extraordinary way--and the straightforward, prosaic, heart-rending, mind-bending lyrics and voice from Kate Bush, this song is a truly special thing. A wrenching, break-up song, with Bush screaming "SUGAR!" at the end. I wept today, listening to it--I am unashamed to say--on the bus to visit an old friend. I had to hide my tears. "You're The One (Remastered)" is track #12 on disc 3 of Directors Cut (Collectors Edition). Music and lyrics by Kate Bush. The song features Jeff Beck on guitar, Gary Brooker on Hammond organ, and The Trio Bulgarka on backing vocals. "You're The One" originally appeared as track #12 on the album The Red Shoes. 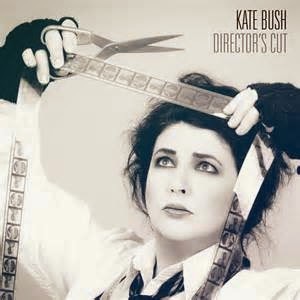 Music and lyrics by Kate Bush. Today we mark the annual, ritual acknowledgment of labor we fail to find, and fail to remember, in the "celebration" of Labor Day--which is really nothing more than the gateway exit from Summertime. I closed a recent post with the ironic assertion that one's labor has no value. This notion is, of course, preposterous and vile. Under the non-protective (except to itself and its systems and beneficiaries) aegis of, following the term-setting rubric of, within the immersive environment of Late Capitalism, it is easy to forget that your labor has value. Your labor does not have a price tag. Your labor is not a commodity. It is not a thing. The value of your labor is not--and does not derive from and is not defined by--your salary or wage. Your labor is not defined by your job description, nor does its value proceed from it. Your labor is a presence and an action. Your labor is attached to, and emanates from, a person and a personality, a past, a present; a body in space and time. Your labor is inextricably bound to and in your sleep; your nutrition; your exercise; your lodging; your familiars, friends, family, and dependents; your leisure; your play; your pleasure; your gender; the color of your skin, the perception of your ethnicity, your education, your class; your age; your health; your mental health; your happiness, your anxiety, your depression, your joy; your thought; your ongoing education; your travel time; your time; time. Never forget your labor has value. Your labor has value. 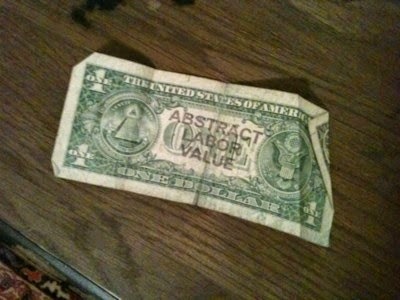 Your labor has value.